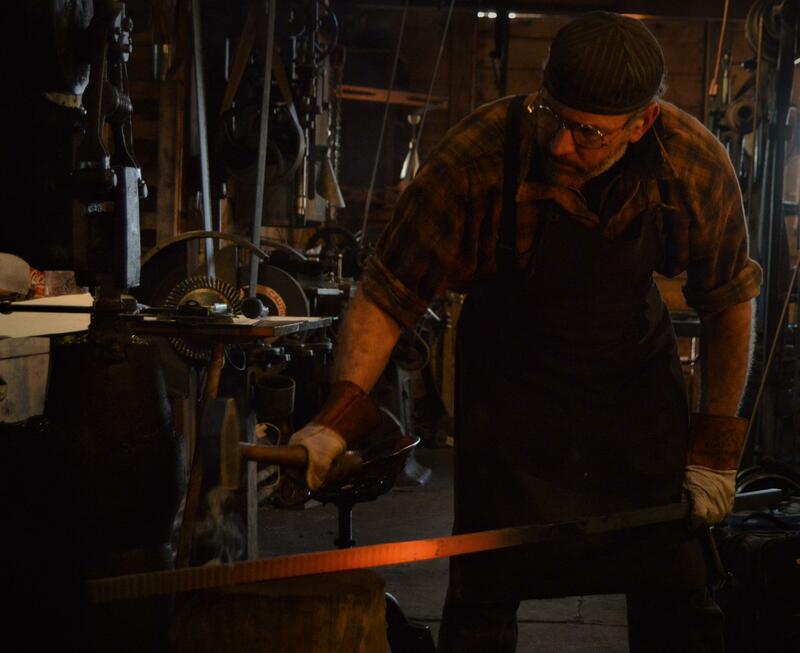 Joel Sanderson at the forge. 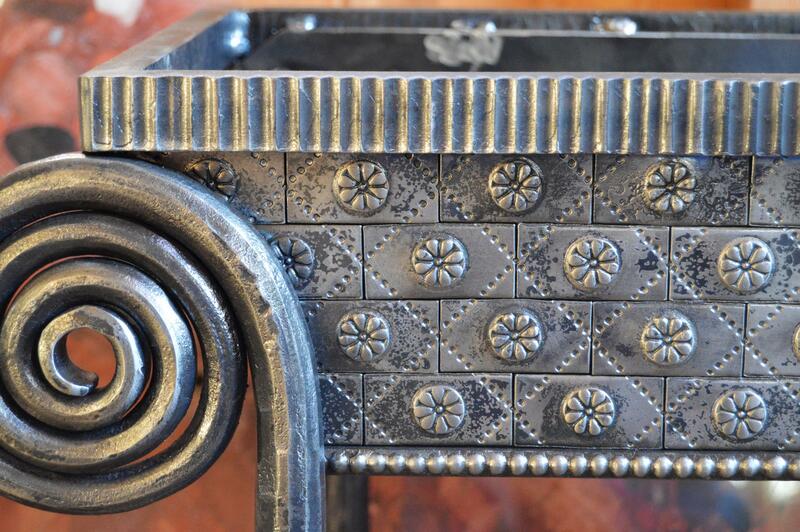 Detail of a Sanderson Iron table. Joel Sanderson with a recent piece. 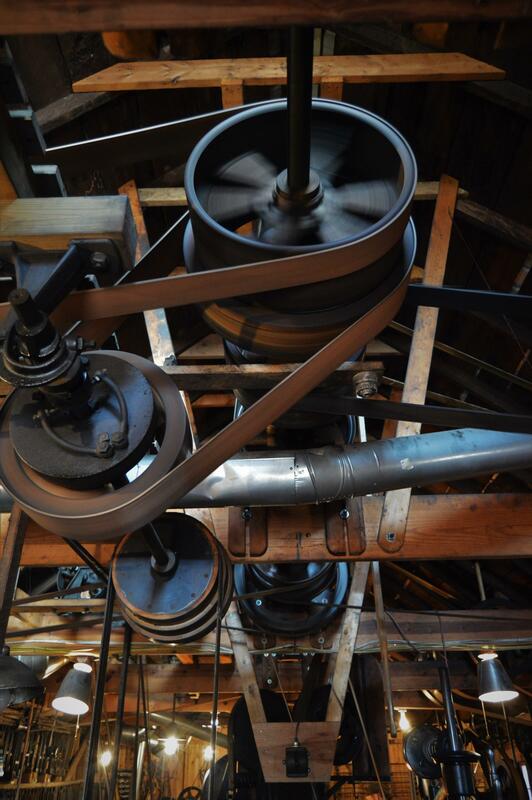 Sanderson Iron is much like a working history museum. Line shaft power is rare. 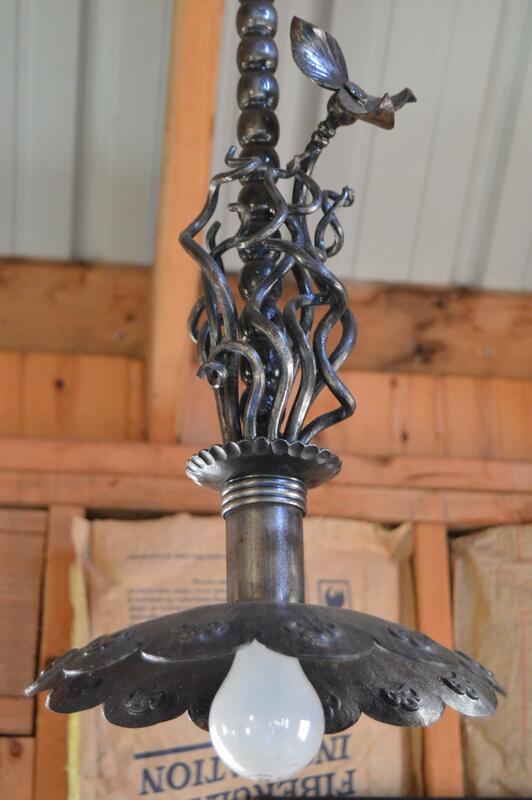 A lamp in Sanderson Iron's shop. 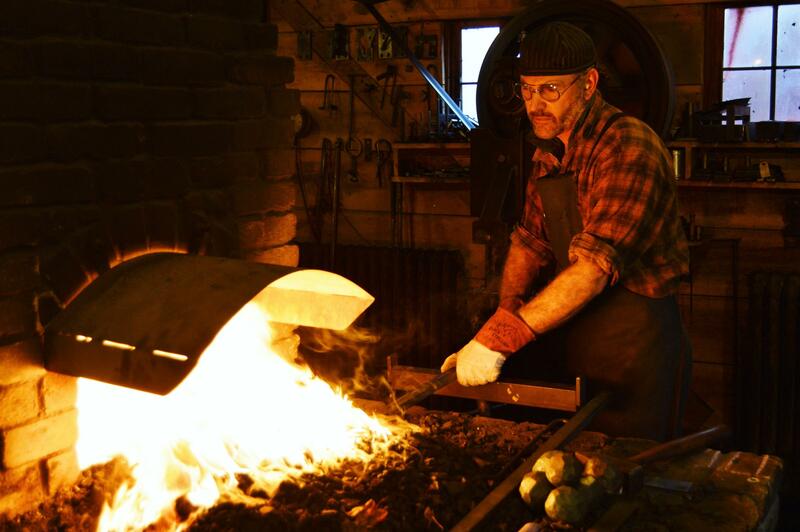 Joel Sanderson waiting for an iron bar to heat up in the forge. The sounds of Sanderson Iron. We’re outside the blacksmith shop of Joel Sanderson of Sanderson Iron near Quincy, Michigan. There's a steady putt-putt sound that comes from the heart of Sanderson Iron. 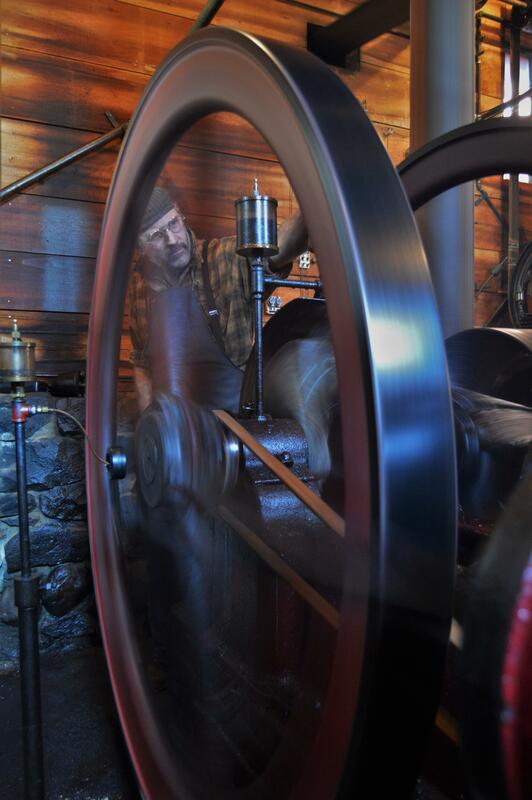 Sanderson checking on the 1898 one-cylinder engine which powers line shafts which run the 19th century machinery in the shop/studio. JS: "The engine was made in 1898. All the machines are powered by it, the lights, the air compressor." LG: "What’s the machinery called that drives everything?" JS: "There’s a line shaft that runs in the engine room, and there are three other line shafts in the shop with belts coming down to the different machines." LG: "Tell us how that’s different from electric motors." JS: "Well, the machines themselves are essentially the same. A lathe is a lathe. But, instead of having a motor built into the lathe, there’s a belt that comes down from an outside power source. But, the machines really haven’t changed much, you know, since they first came out." LG: "So, the big question is: why?" JS: "It’s fun! It’s neat! The machines that I have are tailored for what I do. Okay? So, everything in there has a specific function. And the best machines for forging are from this era." LG: "Well, let’s go inside." 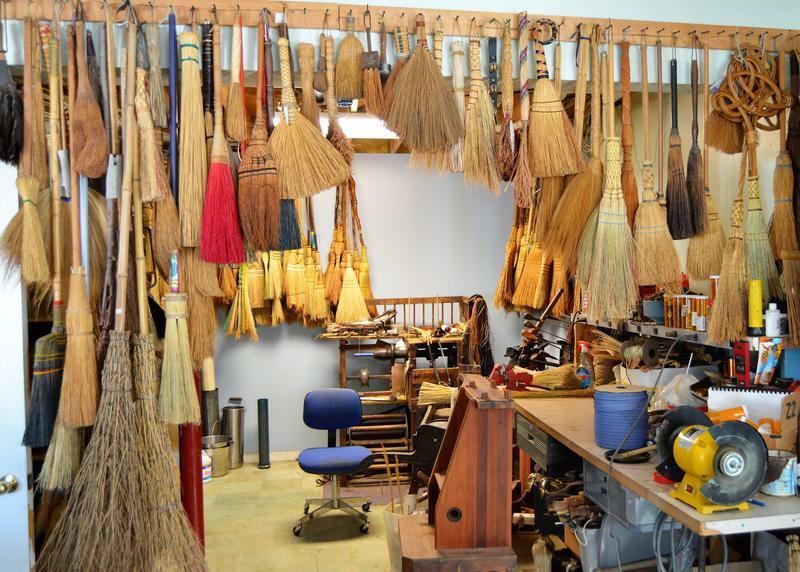 We walk through a small office, the quietest place in the shop. The complex takes up space in three connected wooden farm outbuildings. Then we enter the engine room. It is straight out of the 19th century. The single arm of the piston turns a pair of six-foot flywheels painted red. A complex series of shafts and belts throughout the shop are powered by this one contraption. In the main shop nearly all the machinery is a century old or older. Drill presses, lathes, saws, grinders, and so on. The belts continuously spin, but don’t go into action until Sanderson engages a machine. At the center of everything is a cast iron forge which belonged to Sanderson’s great-grandfather. 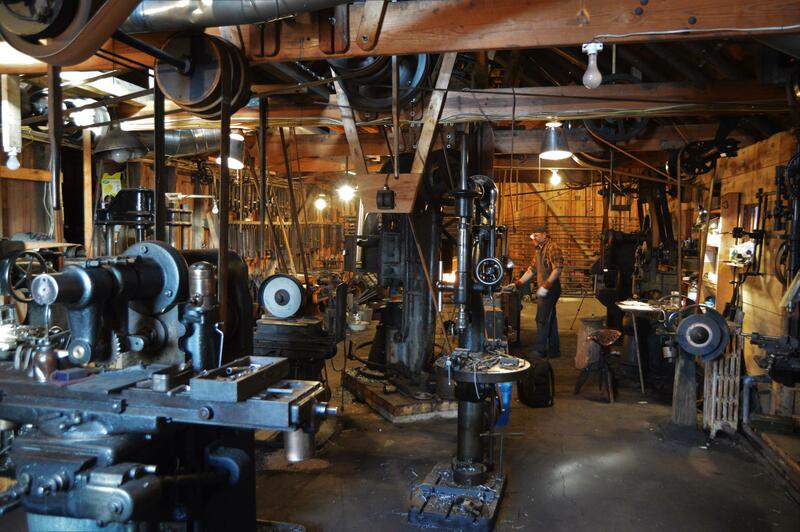 A line shaft and belts provide power to the drill press, lathe, power hammer, and two dozen other machines at Sanderson Iron. LG: "How did you begin doing this work?" JS: "I built a fire. I heated some iron and I hammered it." LG: "Why did you do that?" JS: "Because it’s what I wanted to do. And, I’m not trying to be a joker here. But, I was 14 and I wanted to just play with the iron. So, I did. And I did that for 14 years. During that time I worked for different people. 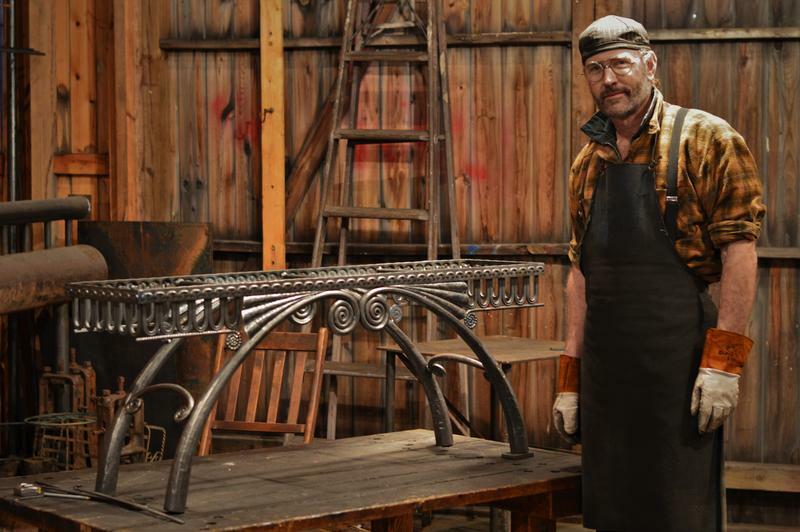 When I was 28 I went out on my own and started making ironwork." Sanderson went to college, studied industrial arts, mechanical drawing, metallurgy, and machining. After that he worked at a couple of blacksmith shops, famous ones in the business, in Ohio and then New York. 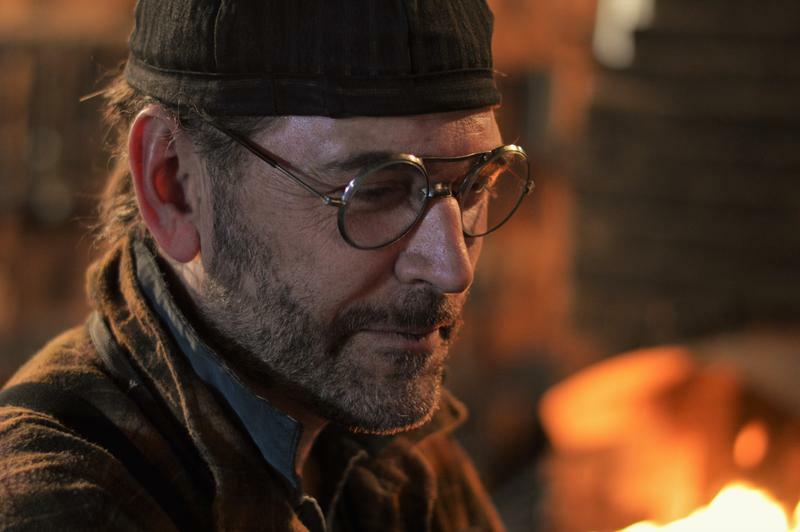 “The only job I’ve ever had has been blacksmithing,” he said with a little smile. LG: "You make furniture. Your style is- you definitely know it when you see it. What do you call it?" JS: "Well, thank you. I don’t know if it has a category. The way I work involves a lot of different mechanical processes: the press, the shaper, power hammers. And so, a lot of it is built around my studio that I’ve accumulated over the years. I have 28 machines here all specific for certain processes, and without them I’m kind of handicapped. So, they’ve influenced the way my work looks as much as my skill with them and around them has." Despite the 19th century mechanical influence, some of Sanderson’s ironwork is at least in part inspired by the Art Nouveau movement. It’s about forging iron into nature, the curve of plant vine for instance. There’s also an Art Deco influence in some of the pieces. But, his style is mostly influenced by improving on the last piece he did. Joel Sanderson straightening a piece of iron he's transforming into furniture. Sanderson says you can’t design on the fly when you’re working with red hot iron. You’ve got to have a plan. And you’ve got to capitalize on what you know. “I have a lot of parts that I can make relatively efficiently and use them in different combinations to communicate different things and to come up with a unique piece. No two pieces, no two finished pieces are alike, but they will share elements,” he said. Joel Sanderson makes a lot of furniture, but he spends the bulk of his time making tables. Mostly he makes tables that he sells through galleries such as Bier Art Gallery in Charlevoix, Toledo Museum of Art, Highlight Gallery in California. 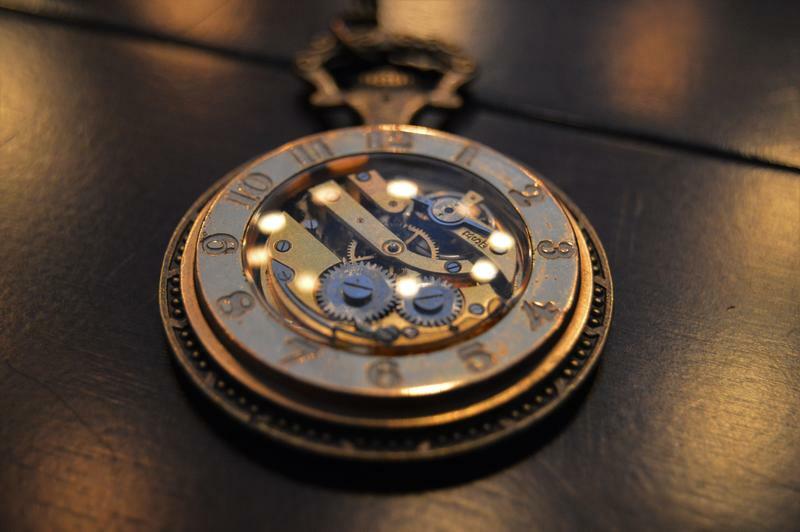 He says it keeps him pretty busy, but he does do some custom work for people. Railings. Lighting. 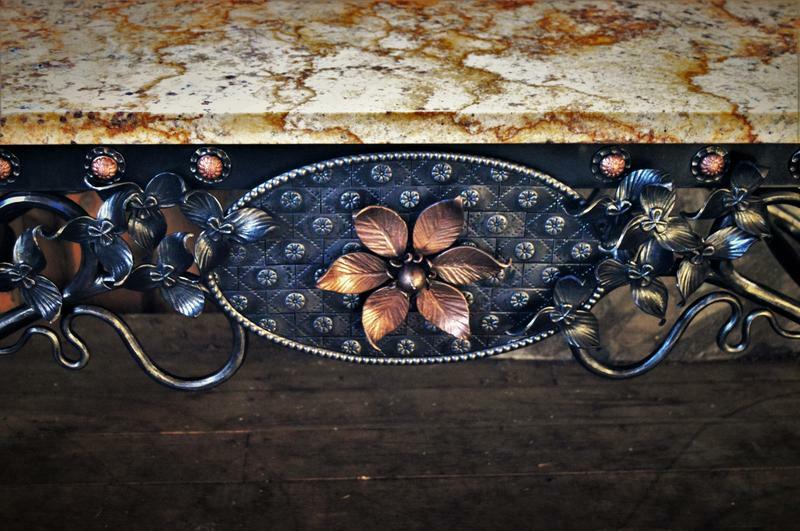 Sanderson says people like handcrafted pieces hand-forged by someone they can identify.